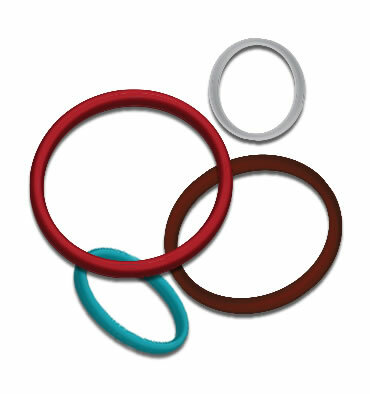 The O-ring is the most widely used seal in the industry. It is easy to install, may be used as a double-acting seal and can seal pressures of up to 800 PSI. With pressures over 800 to 2,000 PSI, backup rings should be considered for higher pressures. The o-ring is typically used as a reciprocating seal, not for rotating shaft applications (Lip seals should be used for rotating shafts). O-rings are typically sized by their inside diameter and cross section, and are further specified by the type of compound used. For O-ring sizes other than standard sizes, specify the actual dimensions desired for the inside diameter (I.D.) and the cross section (W). There may be a tooling charge for such non-standards. We offer Standard O-Rings (AS568), Metric O-Rings, JIS O-Rings, BS O-Rings, Spliced or Vulcanized O-Rings, O-Rings by Material, Custom Molded O-Rings, O-Ring Kits and offer Back-Up O-Rings. We offer these in many componds including: Buna, EP, Polyurethane, Neoprene, Viton, Silicone, Aflas, Perfluoroelastomer, Fluorosilicone, PTFE and more.